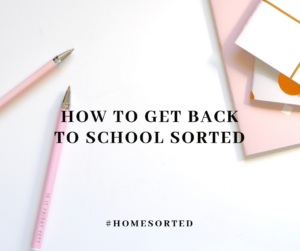 How to Get Back to School Sorted - Home Sorted! There are two kinds of people. Those who get excited at the thought of back to school shopping and those who leave it until the last 12 hours. Which one are you? If you’d rather live in denial and leave everything to the last minute – we’re here to help with this handy guide. Kids have an uncanny ability to grow over the summer holidays – for this reason, we recommend checking that their school uniforms still fit ASAP. You can also use this as a reminder to repair any broken zips, replace missing butting and head to the school uniform store for anything they may still require. One of our favourite activities is shopping for new stationary! If your school has a stationary supplier you can choose to submit your book and stationary lists to them, otherwise mainstream suppliers like Officeworks are a haven at back to school time. Remember to buy a handful of extra items to keep at home. There is nothing worse than encouraging your kids to do their homework, only to find you’ve run out of paper or pens! You should also use this as a chance to get your kids prepared for any extra-curricular or sporting activities that they participate in. This may mean new uniforms, runners, or a tune up for musical instruments, etc. Once you’ve got the basics sorted, it’s time to think about what you’re going to fill your kids’ lunchboxes with every day. We love preparing some healthy options in advance that can be popped together at the last minute. Examples include wraps full of vegetables and a simple source of protein, fresh fruit and granola bars. We also recommend keeping pre-portioned snacks like cut up fruit in the refrigerator and pantry for quick and easy after school snacking. Get into a sleep routine, now! Most kids will struggle with routine when classes resume. Combat this by setting and following a sleep routine in the week leading up to school. This will allow your kids body clock to readjust to the typical school day and hopefully ease off any negative effects for when school starts back!